​All Artists and art supporters are welcome to attend as we revitalize the Illiana Artists. We are so happy to announce Illiana Artists have found a new home which is really our old home and friend Westminster Presbyterian Church in Munster. Because of Shari LeMonnier, WPC's Adult & Children's Education Director, we are back sharing our creativity, ideas, thoughts, questions, and accomplishments. Shari told us that WPC is a big supporter of the arms and welcomed us with open arms. Meetings will be held in a new space, room 303. Because of the passing of our President, MaryAnne Gradisher Kathy Los-Rathburn has volunteered to take over the leadership role of President. Shari LeMonnier has offered to take on the role of Vice-President after the passing of Richard De Pirro. Marilee Jacobi-Popovich will continue with marketing but has resigned the role of treasurer after four years. Suzanne L Dreher has resigned her role as secretary after three years to become treasurer. We are looking for a secretary. It is my understanding a few years ago Shari LeMonnier gave a hands-on evening workshop titled Marbling Paper. Well by popular demand she will be repeating the demo. A good way to get rid of scraps of paper and make gifts at the same time. Bring a sheet of watercolor paper, any size. Everything else will be supplied. We will be collecting dues the night of the meeting. 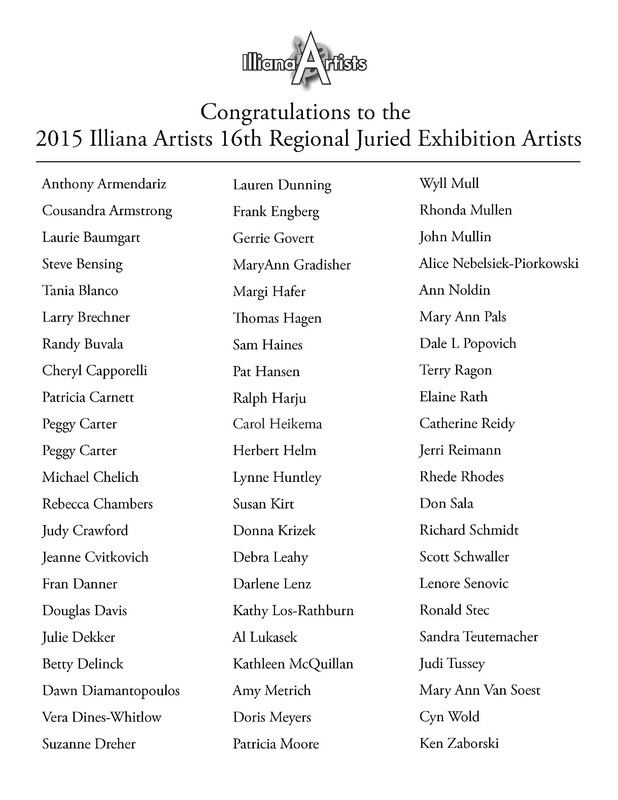 Make your checks payable to Illiana Artists. The dues will pay for the newsletter, website hosting, and yearly domain name purchase. We discussed opening the group to anyone, not just Indiana, Illinois, and Michigan residents since we are now a global community. This will be one of the topics we discuss on Monday, March 12th. If you have any thoughts, ideas and or topics you would like to share to make our group a wonderful place bring them with. If you have any questions please private message Kathy Los-Rathburn on Facebook. Kathy's additional info is below. The Illiana Artists 16th Juried Exhibition Reception and Awards Ceremony took place at the Chesterton Art Center in Chesterton, IN on August 30, 2015. Thank you everyone for making this year's show a success. We had a record submission – artist from Indiana, Michigan and Illinois. Over 140 pieces were received, with 106 plus pieces chosen for the show. Our youngest entry was 18 and oldest 95. Four of our members won this year – Dale Popovich, Kathy Los-Rathburn, Jeanne Cvitkovich, and Peggy Carter. The Illiana Artists organization "Artists Helping Artists" is dedicated to expanding personal and community horizons through artists growth, exhibition, and demonstrations. Members also strive to promote art awareness and appreciation in the community and to share cultural experiences. 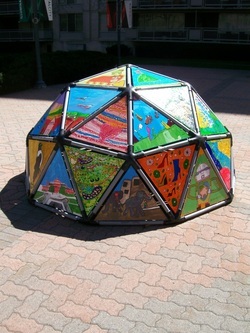 Villiarreal's sculpture at Steelworkers Park in South Chicago has been rescheduled for 11:30 a.m. Saturday, May 9. #1 elf, Ann Noldin has graciously offered her house for our party. The November 10, 2014, guest presenter was our own IA member, Sherri LeMonnier. Sherri walked us through her interesting life experiences as a fine artist. The photos are just a small sample of her impressive collection of acrylic paintings (around 260i) from her spiritual journey through the bible. She talked about her inspirations, how her brush was guided by God's hand and how this experience has changed her life. At the end of the talk Sherri donated several prints of her lovely creations for the IA raffled. Shari Smith LeMonnier is a graduate of Southern Methodist University and received her MFA from the School of the Art Institute of Chicago. She has lived and exhibited world-wide, including Egypt, Greece, Germany, and France and extensively throughout the U.S. She has been the recipient of numerous awards and honors including the John Quincy Adams Fellowship from the Art Institute of Chicago, an Indiana Arts Commission grant, and National Endowment for the Arts supported projects. Most recently she has received recognition from the Middle East Council of Churches, the Embassy of Afghanistan, and the White House for her spiritual and peace related painting. The October 13, 2014, meeting will be held at the Westminster Presbyterian Church, 8955 Columbia Ave., Munster, at 6:30 PM. Guests are always welcome to join in the camaraderie, refreshments and the demo, which will be presented by Rick Therrio. Rick has been a Chicago artist for many years. 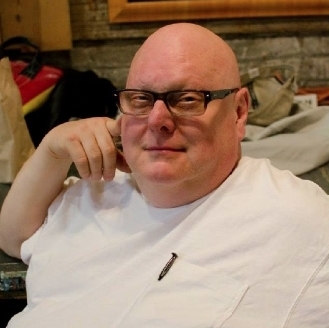 He exhibited publicly throughout the 80’s and 90’s at galleries such as World Tattoo and Art-o-Rama and was part of the collaborative known as The Colson Truck Group who staged monthly shows at a jazz club on Division Street ‘The Bop Shop' in addition to organizing their own exhibitions. For 12 years or so, beginning in 200 Rick focused on producing work and had little enthusiasm for finding venues to exhibit in. For the last six or seven years he has worked in Prismacolor colored pencil and pencil, sometimes using graphical software on a computer to manipulate his work. In 2012 he moved from Humboldt Park in Chicago to Lansing, IL and joined Paul Henry's Art Gallery where he has exhibited his colored pencil drawings, oil paintings, painted lamps, and work produced on a Wacom tablet. He has also become very involved with helping to manage the South Lake Artist's Co-op. His imagery has evolved from a wide variety of sources, music, films, literature, comics, history, and science fiction. He finds an inexhaustible source of humor in the absurdity of existence. Call Ann Noldin at 219-864-0593 for more information. There will be a raffle of the artist’s work Rick is donating three unframed prints of photo manipulations and drawings done on a Wacom tablet from my DOG series. Looking forward to seeing you on October 13th at 6:30 pm at The Westminster Presbyterian Church, 8955 Columbia Avenue, Munster, Indiana 46321. Welcome Suzanne Dreher, sgdstudio@sbcglobal.net for volunteering to take over Carol's secretarial roll. Here's a sample of Suzanne's work. We are still looking for a someone to fill in for Richard's Vice President seat. 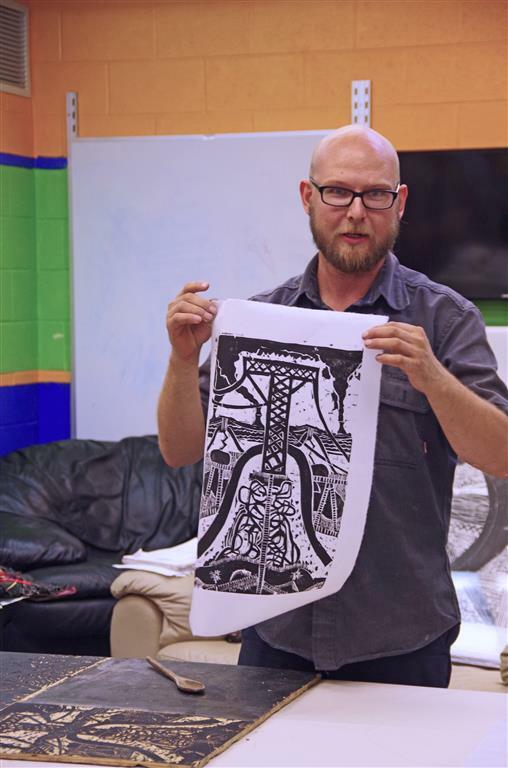 Corey Hagelberg will be giving a lecture and demonstration on how he creates his print making. He will also explain his inspiration in doing assemblages. Hagelberg is currently an Adjunct faculty member at Indiana University Northwest. He is also a board Member of Miller Beach Arts and Creative District (2012-Present) a community based organization that is working to revitalize the Miller Beach neighborhood of Gary, IN through arts based. Hagelberg's work titled The Effects of Good Government was shown this this year at the Indiana University Northwest Contemporary Gallery, Gary, IN. Artist Statement: I seek to emphasize and embrace opposites and contradictions in our everyday experiences. My work blurs the line between humor and tragedy, current and historical, traditional and non-traditional, high art and low art, natural and industrial, accusation and confession, and beautiful and grotesque. I hope that it will encourage the viewer to evaluate and challenge their own notions of meaning, value and beauty. The imagery and symbolism in my work comes from my life in the Calumet Region of Indiana. This region on the southern shore of Lake Michigan is where the rare biodiversity of Indiana Dunes meets one of the most industrialized regions in the world. Much of the natural beauty of this area was destroyed in the name of progress. Yet, as the lake and wind move sand on the shore, new dunes are formed. It is this symbol of “rebirth” that inspires my work. Educational Statement: The intention of my work is to highlight the value of places and objects that are often overlooked. I hope that my work will influence people to consider their own beliefs in relation to beauty. 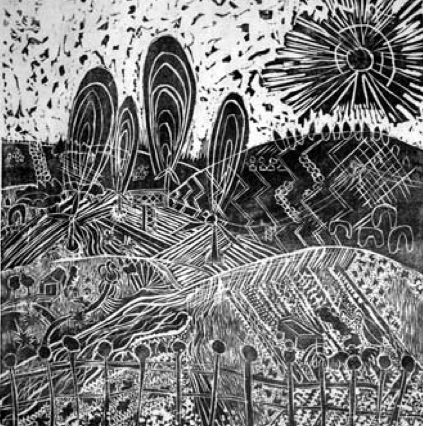 My woodcuts usually begin with an idea, story or place in mind. I generally start by laying out larger shapes and compositional elements. As I carve, the finer details and textures naturally immerge. This process can take several months. I find that this slow process allows me to spend the necessary time to create a well-developed and deeply personal image. Woodcut is a traditional process that is older than paper itself. Each work is hand carved from a block of birch or pine and then printed of on a sheet of mulberry paper with a wooden spoon. My assemblage work starts by affixing a single object a 2-dimensional surface. I glue, nail, screw and wrap additional objects to build the work. As I work, I make decisions to emphasize or mask certain objects based on my formal preferences. As objects are juxtaposed, new and unexpected meanings are created. Looking forward to seeing you on September 9th at 6:30 pm at The Westminster Presbyterian Church, 8955 Columbia Avenue, Munster, Indiana 46321. Here's our newly elected IA leadership. We have also included everone's duties as officers of AI. If you have any questions just drop them an email. Duties: The president shall conduct the business meetings and be authorized representative in business matters pertaining to the Indiana Artists Incorporated. Duties: The vice-president shall conduct the business meetings in the absence of the president. The president shall be responsible for all reports from all committee chair. In the absence of the president the vice-president shall act as the Illiana Artists Inc. representative in all business matters. The vice-president will be responcible for locating or accepting suggestions for guest speakers. The vice-president will be the contact person for guest speakers. Duties: The secretary shall be required to take minutes of all business meetings and submit them to the president. The secretary will report to memberships and convey the minutes of previous meetings to be ratified by membership. The secretary will be responsible for correspondence deemed necessary for the operation of the Illiana Artists. Duties: The treasurer shall handle all monies and must be bonded. Receipts for all expenditures must be submitted to the treasurer for payment. The treasurer shall send a yearly statement for membership dues.Treasure will submit a list of members to the leadership. Dinner will be served at 5:30pm. If you like come earlier and enjoy nature, bring your camera, do a little sketching or Plein Air. Please call or email MaryAnn and let me know what you would like to bring. 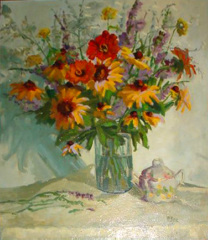 The artist will be demonstrating and explaining the academic painting technique of oil over tempera. “Technique Mixte” is an adaptation of the “old masters” oil painting technique employed by the likes of Leonardo da Vinci, Jan Van Eyck and Albrecht Durer. 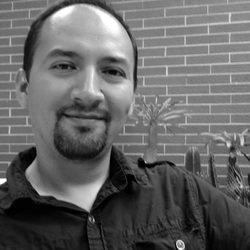 Javier Chavira earned an MFA from Northern Illinois University’s School of Art in 2002, has exhibited nationally and internationally and his work is in numerous public and private collections. Aside from being an active artist, Javier is also an educator. He is an Associate Professor of Painting and Drawing at Governors State University, Illinois, a position he’s held since 2003. 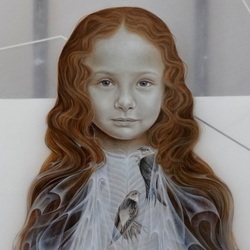 Javier is represented by 33 Contemporary Gallery, Chicago and currently resides in Crown Point, Indiana with his wife Sarah and their daughter Paloma. 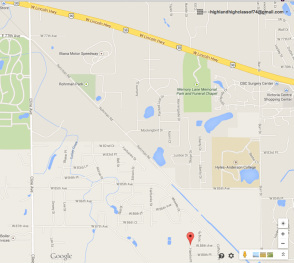 Click here for map directions. 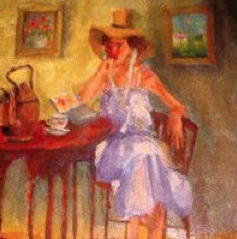 Sandie Bacon is a versatile artist known both for her paintings and her public artwork. Important elements in her work derive from the direct observation of the environment: the patterns, rhythms, and forms of nature cycles. Direct drawing reveals what lies underneath: the specificity of the moment. Layered with that is a passion for textures, materials, color, and her artwork is informed by literary and psychological imagery. Ms. Bacon is a member of the Dandelion Gallery in Waukegan, and shows in galleries and museums on a national basis. She just completed several public art projects: a "fire hydrant" to honor the families of fallen fire fighters, a "lighthouse" to depict the upcoming art scene in Edgewater, and two" ostrich eggs" for the Madison Zoo. Her painted "Cool Globes" have been shown internationally, and two are now housed in Jerusalem. Her artwork is in many personal and corporate connections including: The Coyne Foundation, the William Blair Foundation, an artwork in the Harlem office of Bill Clinton, the Warren-Newport Public Library (Gurnee), a commissioned mural in the Lake Bluff, Il train station. Gregg Hertzlieb will be giving a lecture and demonstration on how he creates his watercolor and ink drawings. 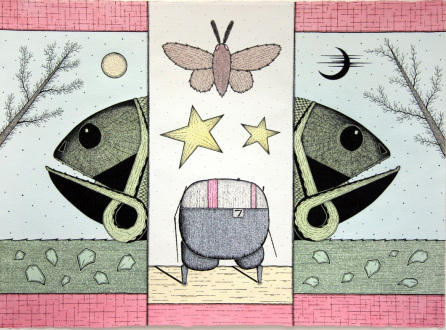 Hertzlieb is fond of working on paper and in particular likes to work in a linear and meticulous fashion with pen and ink; he uses watercolor to create broad expanses of tone and finds that he has had to refine his technique over time to achieve the look he desires. Hertzlieb’s drawings are autobiographical in nature and present fanciful narratives involving a playful cast of characters he has developed. 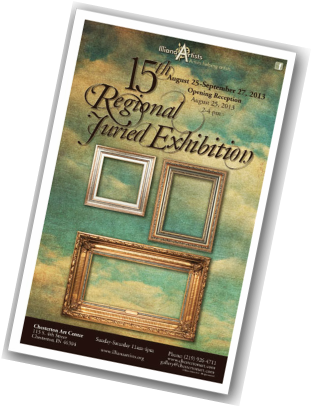 He wishes for his works to appeal to viewers of all ages and hopes that those attending his lecture and demo will come away with some new ideas about handling ink and watercolor, as well as finding inspiration in the imagination. Hertzlieb is the director/curator of the Brauer Museum of Art at Valparaiso University in Valparaiso, Indiana. He has a master’s degree in fine arts from the School of the Art Institute of Chicago and a master’s degree in education from the University of Illinois at Chicago. Hertzlieb has shown his art in numerous exhibitions. His work is in both public and private collections. Hertzlieb is the editor of the books The Calumet Region: An American Place (Photographs by Gary Cialdella) (2009), Heeding the Voice of Heaven: Sadao Watanabe Biblical Stencil Prints (2010), and Domestic Vision: Twenty-Five Years of the Art of Joel Sheesley (2008), as well as a contributor to the books The Art of George Ames Aldrich (2013), The Indiana Dunes Revealed: The Art of Frank V. Dudley (2006) and American Railroad China: Image and Experience (2008). In addition to performing his duties at the museum, Hertzlieb teaches Museum Studies, Managing Facilities, and Printmaking; serves as art editor for Valparaiso University’s journal The Cresset; and contributes essays on Brauer collection objects to the Valparaiso Poetry Review. Hertzlieb is a native of Northwest Indiana and lives in Chesterton. In my work, I enjoy bringing together various items or characters that mean a lot to me as a person and as an artist. The head or face that appears in so many of my pieces is based on a small wooden figure that I purchased at an import store. I am very fond of this object and was inspired to draw it for the first time in early 2005. The figure with the number seven at his waist represents me, a traveler through life who searches the southern shore of Lake Michigan for precious crinoid fossils. The fish, rainbow, sun and moon, and other assorted items floating in the sky all present aspects of my personality and varied interests. I hope to tell a story in my pictures, and the story is basically an extended investigation of who I am and what I discover in the landscape of both my imagination and the region I call home. In a sense, I wish my works to function like a message in a bottle, where through the drawings I reach across time and space to communicate to the viewer the way I felt, the things I was thinking about, as I created the picture. I concentrate primarily on drawing because I like the directness of this art-making approach. Each pen line I apply to the paper breathes more life into my chosen subjects, and I enjoy the thrill of seeing these subjects emerge and proclaim their individual identities. Overall, my art takes me on a quirky, surreal journey of self-discovery, where pleasant characters get invented in the process that, through their disarmingly unusual natures and appearances, encourage viewers to perhaps plumb their own imaginations and delight in the wonders they may find there. Looking forward to seeing you on March 10th at 6:30 pm at The Westminster Presbyterian Church, 8955 Columbia Avenue, Munster, Indiana 46321. 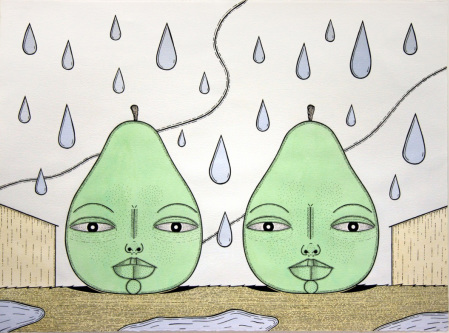 ©2013 Gregg Hertzlieb – 2 Pears – watercolor and ink on paper – 22x30"
©2013 Gregg Hertzlieb – Mirror Fish Heads – watercolor and ink on paper – 22x30"
Illiana Artists™ Inc., an organization of “Artists Helping Artists” is dedicated to expanding personal and community horizons through artists growth, exhibition, and demonstrations. Members also strive to promote artawareness and appreciation in the community and to share cultural experiences. Questions, contact Richard DePirro, (219) 365-4667. 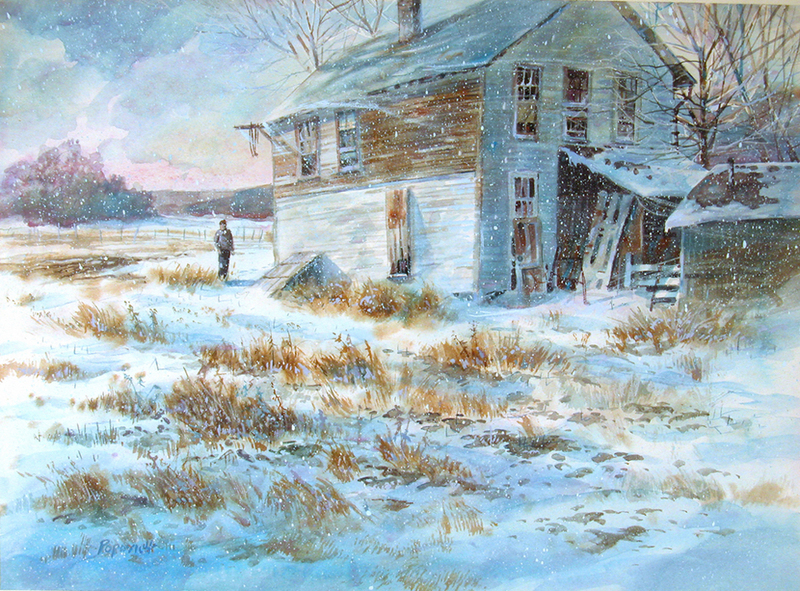 Dale L Popovich, DalePopovich.com Illiana Artists member will demonstrate his techniques in watercolor on February 10, 2014 at 6:30pm at The Westminster Presbyterian Church, 8955 Columbia Avenue, Munster, Indiana 46321. SEE MAP BELOW. He was the Second Place winner at the Illiana Artists' 15th Juried Exhibition last August at the Chesterton Art Center in Chesterton, IN. 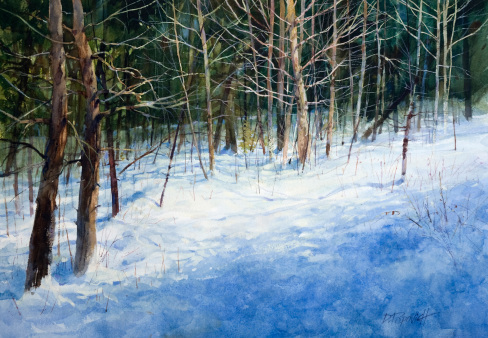 Dale is an award-winning watercolorist and teacher who is passionate about capturing the raw beauty of the American landscape with the fluid stroke of a brush. Talent and training aside, it’s Dale’s vision that best informs his work. Temporarily blinded at age 20 for 1-1/2 years, Dale learned to rely on his mind’s eye to sustain him. After a nine hour major brain surgery removing a cyst on his optic nerve, he had to learn how to walk, talk and write again. With vision finally restored, he discovered he could see more clearly than before, easily filtering out the visual “noise” around him to focus on a subject’s essentials. His paintings began to reflect a certain purity of perception, and this “way of seeing” became the hallmark of his painting. Trained at The American Academy of Art in Chicago by Director and President, Irving Shapiro, AWS. Dale was deeply inspired by this great American twentieth-century watercolorist. Dale later taught for many years at The American Academy of Art. Many of Dale's paintings carry a piece of his youth, spending his childhood summers in the Northwoods of Wisconsin, he learned to love its colors, textures, denizens and moods. Today, his paintings celebrate these American landscapes and man’s humble efforts to tame it. 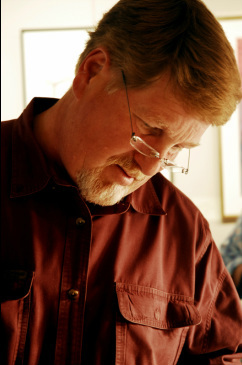 Currently, Dale teaches at the prestigious Palette & Chisel Academy of Fine Arts in Chicago. The Palette and Chisel is an association of representational artists, founded in Chicago in 1895, is the second oldest artist organization in the United States, and membership is by an invitation only. He also has workshops, demos, and teaches weekly classes in his own studio in Highland, IN. He takes a holistic approach to painting with his students. Devoted to both painting and teaching, Dale’s work hangs in collections around the country. 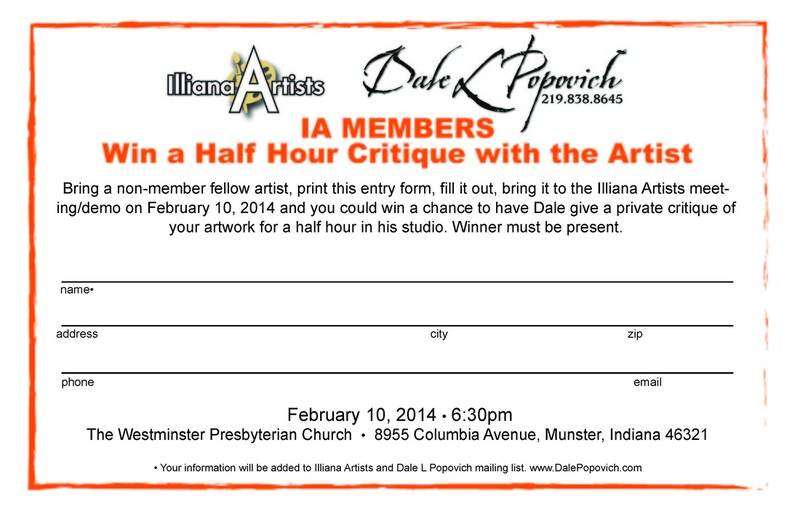 You could win a chance to have Dale give you a private critique of your artwork for a half hour in his studio. Winner must be present.CLICK ON THE ENTRY FORM ON THE RIGHT FOR A DOWNLOADABLE VERSION. You will be able to find Kathy Los-Rathburn's two paintings "My Bleeding Hearts" and "Eat Your Veggies" in the Richeson 75: Still Life and Floral hard cover book. Both these paintings were chosen as meritorious entries. It is always nice to be published in a book. Carol Heikema has submitted a CD of her paintings for over a year to Martha McGuckin from Chesterton Art Center and has had 8 of her watercolor and poured ink paintings accepted for display at the Valparaiso Health Center for 4-8 months. "It is with a very heavy and sad heart that I have to tell you that Mary, my mom passed away last night from complications after heart surgery. Thank you all for your kindness, love, support and prayers for her this last month. Blessings to all of you." Steve Bensing was our guest speaker on Monday, Oct 14, 2013, 6:30 pm at the Westminster Presbyterian Church, 8955 Columbia Avenue, Munster, Indiana 46321. He discussed his interested in photography at a very young age. He got his love for photography from his father and grandfather who also enjoyed taking and developing photos. He stated he liked to use my imagination with hisy photography. Steve took classes in high school to learn techniques. In college he took pictures for publications, bu also entered his photography in his first art show during that time. Currently, he is a member of the Duneland Photography Club and the Chesterton Art Center. His work has been displayed at juried art shows such as Art Comp at the Chesterton Art Center, The Illiana Artists Regional Juried Exibition, and the Manito Art Show in Manitowish Waters, WI. He have also won awards at photography contests at the Annual Gardening Show in Porter County and the Open Class at the Porter County Fair. He currently sell my work at 7 galleries and shops in northern Wisconsin. These include: Stone's Throw in Bayfield, Arlene's Pottery in Boulder Junction, Cranberry Square in Manitowish Waters, Gaslight Antiques in Minocqua, Great Northern Coffee Traders in Minocqua, Northern Memories in St. Germain, and Umlauf Art Studio in Lake Tomahawk. He discussed creating photography as art. Just like an oil painter uses paint, canvas, and brushes as tools to create art, an art photographer uses a camera and other tools to create art. Conversely, not everyone who uses a brush is an artist, nor is everyone who pushes a button on a camera is an artist. But in a skillful hand, with a keen eye, and a vision in mind, these can be tools of artistic expression. Steve presented ways photography can be used as a means of creating art. He also discussed how to effectively take photos of your own art. NWITimes write-up. AI is now emailing their newsletter. We felt we could supply more info to our members plus color pictures. " We are very excited about this big step for IA. Even if you don't have a computer you can go to a local library to read all the content. Our group has so much to share and now we can do this though digital media." Click here to receive your newsletter. Just send an email with your full name, address, city, state, phone number and email address. Thanks. Download the exhibition booklet. Just click on the cover. The Illiana Artists 15th Juried Exhibition Reception and Awards Ceremony took place at the Chesterton Art Center in Chesterton, IN on August 25, 2013. Over 100 pieces were received,with 80 plus pieces were chosen for the show. Two of our members won this year – Dale Popovich of Highland and Kathy Los-Rathburn of Griffith. IA member Ann Noldin from Schererville sold her watercolor, Need Name Ann. No part of this site may be reproduced, stored in any form or by any means, without the prior written permission of the copyright holder.